WILA's Tooling Systems are the international benchmark for quality and productivity. In order to provide maximum flexibly and meet our customer's preferences, WILA Tooling has been divided into two distinct product categories: Premium and Pro. Press brake Tooling of the very highest quality, which are based on WILA's long-standing expertise and experience. WILA's highly regarded product range has an international reputation when it comes to tools for bending products with extreme tolerances and very complex requirements. Premium is renowned for its performance and quality in sheet-metal processing industries throughout the world. The leading standard for bending applications with less extreme requirements, but where high quality and productivity are still essential. Pro is a comprehensive product range for press brake tools with a limited working height. An intelligent combination of clamping system and tooling helps to guarantee perfect bending results. The WILA product range designed especially for the North American market. WILA American Style Press Brake Tooling and Accessories have been carefully adapted by WILA to suit the North American approach to sheet-metal bending. This range of products is ideal for all press brakes with an American Style ram configuration. Of course, WILA's American Style product range is also characterized by very high quality standards. 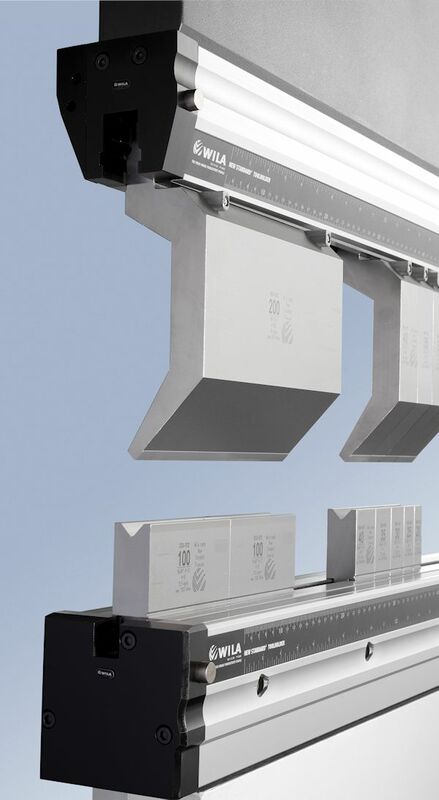 Thanks to its Tooling Systems and the Universal Press Brake concept, WILA is able to offer a range of solutions for almost all bending applications. While some requirements and situations can be beyond standard solutions. WILA addresses these special product needs with its customary level of quality. Customized versions of WILA Press Brake Tooling are tailor-made in accordance with your specifications. We invite you to contact us to explore the full range of possibilities.